Nestled on a strip of land between the Caribbean Sea and Nichupté lagoon, this luxurious, all-inclusive resort is just about 3 kilometres from Mayan ruins at El Rey Zona Arqueológica. Casual rooms offer balconies with stunning lagoon or sea views, and feature flat-screen TVs, free Wi-Fi, minibars, iPod docks, and tea and coffeemakers. Meals and drinks are included at the resorts multiple bars and restaurants. Other amenities include a spa and a gym, plus sports courts, an outdoor pool, a 9-hole golf course and live entertainment. All of this makes it for a perfect place to stay on your visit to Cancun. Create a customized plan for your visit using the Cancun trip planner. You can use ready templates or start from scratch for the same. Hotels like Villa Italia, Sina Suites and Oh! - The Urban Oasis will solve your problem of where to stay in Cancun. Chalk out the best way to discover the city with Cancun vacation packages. Check out various modes for how to reach Cancun. We stayed at the Pyramid Oasis and was a great experience. When you pay the extra for the VIP it is totally worthy. The activities they have at this resort are more oriented for young adults and older, and paying the extra will get you pretty much everywhere without feeling out of certain restaurants with better quality of environment. The attention and service was excellent. We have to be more understandable about waiting in line to some restaurants or cleaning the rooms (we found out they were over capacity). Lots of young people having fun and that's fine, I was young once too. So, I will recommend the Palm Oasis for families with kids 12 and under. Overall, the best experience I had in Cancun, I will definitely will come back. Thank you to all people that helped and served us very appreciated. It may be older but it's well maintained. Great staff, Very clean and a good value if you stay out of the gift shop. Breakfast and beach cafes always great. Lunch and dinner restaurants hit and miss. Fun place for a (wild!) spring break. 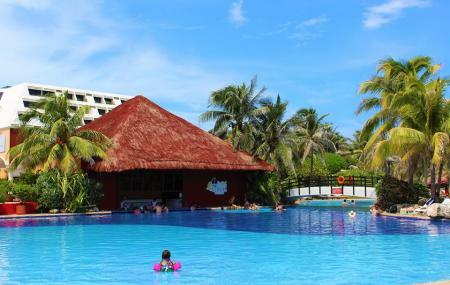 This is a huge resort located on prime beach, and the pools are excellent, too. This is, however, a party resort, not a family resort. We went during spring break, and it was a lot of fun, but the entire place was rocking until after 3am every night! If this is your thing, then this is the place for you. Highly recommended! Check in process is horrible. Buffet was no good. The rest of the resort is wonderful. If you want to drink I recommend tipping the bartender they don't forget you when you do. The rooms are very nice and plenty of options for food. We will come back.